The road is rough and long. At the beginning it is rocky. Almost like cobblestone abandoned by a previous empire, but rougher, and It is dusty. It follows Lake Izabel for a while then crosses a smoky green river. A rusty leviathan from another era belches out iron oxide coloured smoke. It is enormous and along the way. What is being produced there we are not sure of. Garbage is everywhere for a while. A different Guatemala. Women and girls, in long purple blue skirts with sheer tops, walk along the roads. Some carry bowls on their shoulders with what looks like dough. Other bowls seem to contain corn. Three small boys block the roadway. 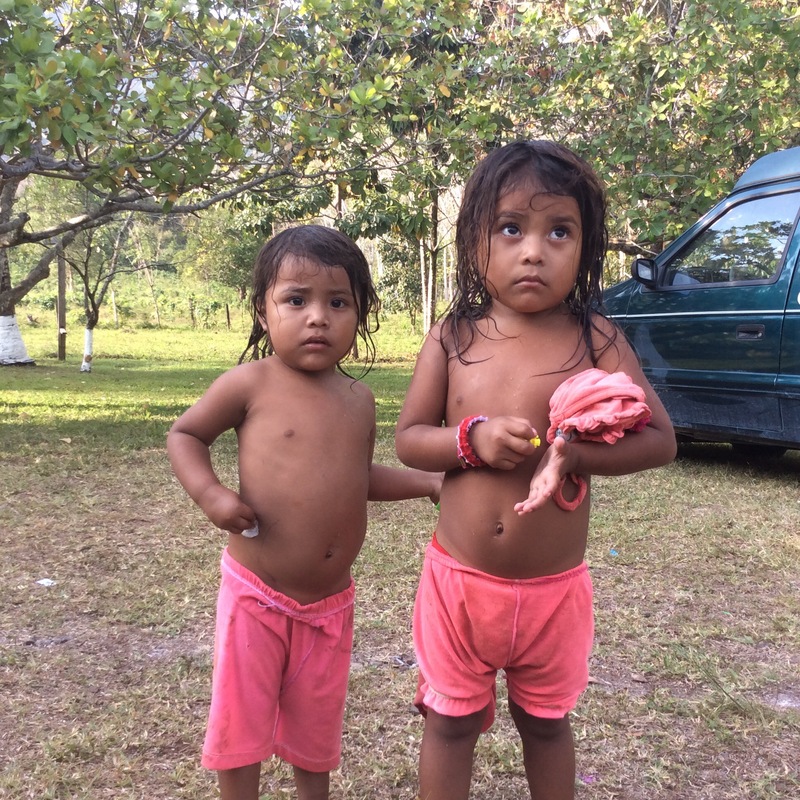 They cannot be kindergarten age yet they stare down us travellers. Their eyes are serious and would be dangerous if they were older. One pushes against our friends’ van in front of us and will not let them pass. One of them will only move after loud honking. Eventually we pass by, enduring the icy gazes. Men repair holes randomly along the sixty odd kilometre way. They wave for money for their services as we continue on. 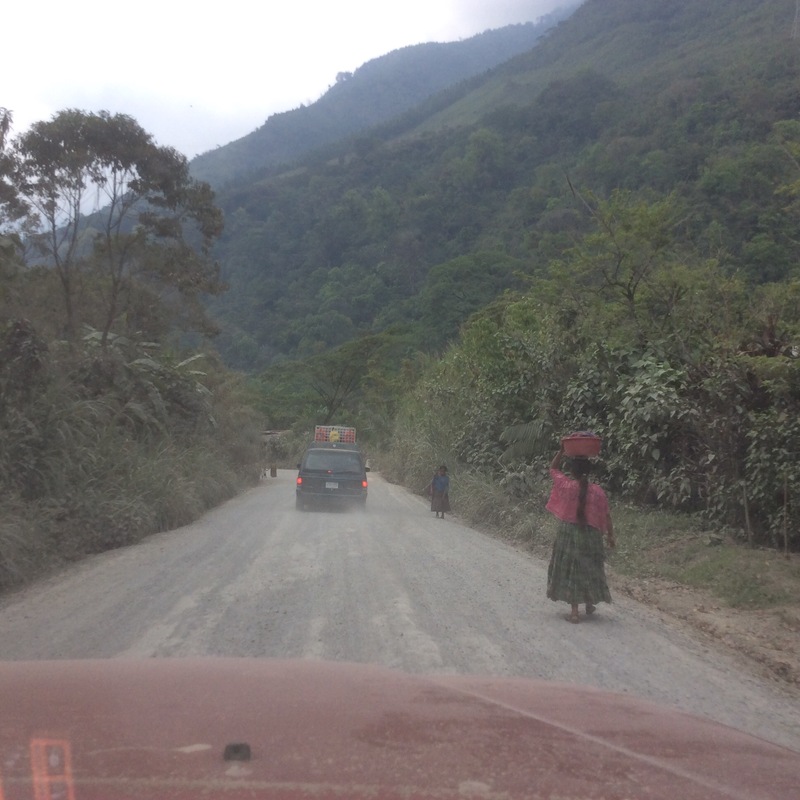 Earlier, other men and boys drove what Matt calls Guatamalan logging trucks. 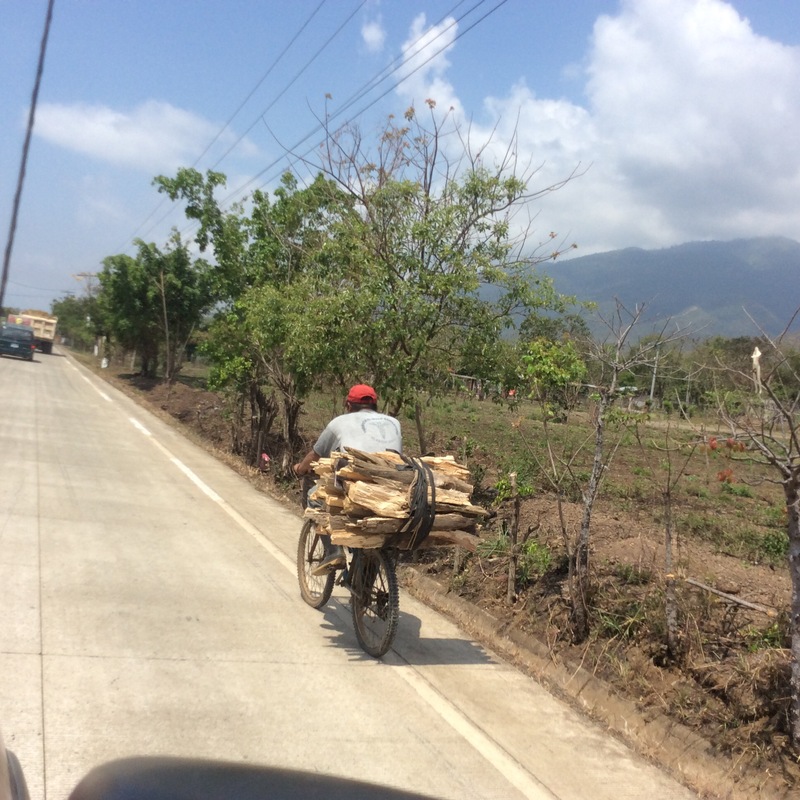 These are bicycles, each weighed down with logs and hewn wood that is close to breaking the frame. Less fortunate men and boys utilize a shaky shuffle, unable to lift their feet as they carry unimaginably heavy loads on tump lines, their necks and faces strained as they move slowly toward unknown places. A small boy, dwarfed by a sack that is triple the volume of his body, evaporates into a cloud of dust on the road as vehicle upon vehicle churn up the earth. He waits as they pass – he will continue on with his work. Desperate middle aged women rush our truck as we slow down at a switchback, each brandishing several bunches of small bananas. We buy two big bunches for ten quetzals from one as the rest continue to try to sell us more, even though our lack of need is obvious. 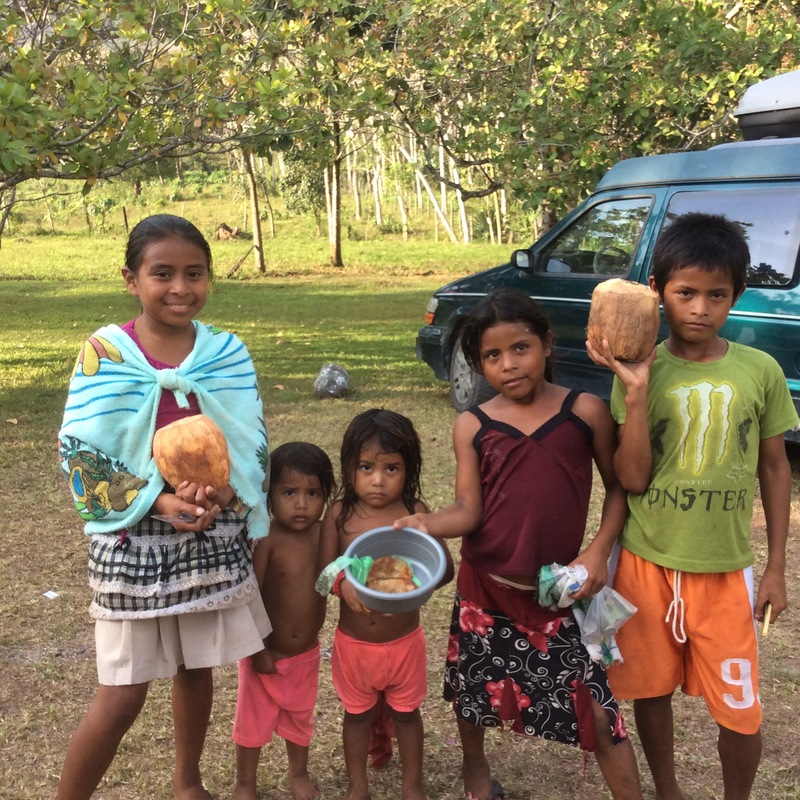 We have seen this before, as the the children selling coconuts on the highway run at us, alternating the sway of the coconuts with the flash of the long sharp knives they are carrying. We are a chance to make a bit of money. They are persistent, and our hearts go out to them. Yet, opening the door to charity here is not understood in a way that we have encountered. The need is never sated, and a kindness or a purchase leads directly to a demand for yet another sale, or another cookie. They wait while we drink the water from the coconuts, then beg us for the coconut meat from the fruit they have just sold us. Previous Previous post: Tikal Me Pink!